Your Best Trading Ideas…in One Day! How would you like to have the ability to program, backtest and automate your best trading ideas? And learn how to do this from one of the top TradeStation experts in the world! We are currently offering a recorded full-day course on how to professionally backtest and automate your trading strategies in TradeStation. 1) Know how to program a trading strategy. 2) Know how to backtest and validate that strategy. 3) And know how to automate that strategy. This is knowledge which you will be able to apply to your trading for the rest of your life. In this class you will start from the beginning and within hours have the skill to take one of our Strategy Guidebooks and program it in TradeStation yourself. Plus, you will have the knowledge to automatically trade your strategy once the class is completed. If you’ve been trading for any length of time, you’ve probably wondered how well a particular technical indicator has identified profitable trade set-ups in the past. Maybe you just want to be self-sufficient enough to find your own trading signals on a daily basis rather than waiting for someone else to send you trade alerts. Or perhaps you’re already trading a quantified strategy and you’d like to automate it. TradeStation is a powerful technical analysis program, with advanced charting, backtesting, optimizing, scanning and auto execution (in both simulated and real accounts) capabilities. TradeStation is utilized by all types of traders to develop and test and automatically trade their strategies. You will learn how to program, backtest, and automate your trading strategies in one day in this course. Create, modify, backtest, optimize, and execute simple TradeStation Strategies. Create your own custom indicator, and add it to an TradeStation chart. Use RadarScreen and the TradeStation Scanner to find the best strategy set-ups. Approximately six hours of online instruction with TradeStation expert Stuart Okorofsky (see Stuart's biography below). Ability to interact with the instructor to ask questions, troubleshoot problems, etc. TradeStation code templates that you can easily modify for your own needs. A free copy of the Strategy Guidebook “ConnorsRSI Selective Strategy for ETFs and Stocks”, which we will use as the basis for our backtest. A desire to properly learn basic TradeStation programming. TradeStation 9.1 or later installed. "My path to EasyLanguage Programming is quite a circuitous one. I graduated from SUNY Buffalo in 1974 with a Degree in Computer Science. At that time, PCs did not exist, mainframes took up entire buildings, we used punch cards to write computer programs and there was no Internet. After graduation I worked for McDonnell Douglas as a programmer. I was unchallenged by the corporate world so I quit and got involved in another profession. One day in the early 1990s I got a piece of mail from Ken Roberts about trading Futures. I was fascinated by it and took his course. I got hooked on trading. I saw a TradeStation demo at a trading seminar, bought the software and began writing code. Despite the fact that I hadn't programmed in 20 years, it came back to me very quickly. Programming is a way of thinking and I had always been good at it. At the time, there were only a handful of TradeStation Programmers so I began writing programs for other people. Before I knew it I had a full time business. I quickly accumulated so many clients that I stopped trading, transitioned out of my other business in order to program TradeStation full time. Over the past 20 years, I've written indicators and strategies for hundreds and hundreds of clients. I still have clients that I code for who that have been with me from the very beginning of my career. Larry Connors is one of them. My clients run the gamut from private traders to very large hedge fund managers. I have also worked with high profile authors like Tom DeMark, Walter Bressert, and Dave Aronson. 1. To teach you how to correctly program, test, and automate your trading in TradeStation. 2. It’s to also share with you my insight and 20 years experience in systems programming". TradeStation is a comprehensive technical analysis program, with advanced charting, backtesting, optimizing, scanning and auto execution capabilities. For those not familiar with the application, we will quickly cover some of the major areas of functionality. 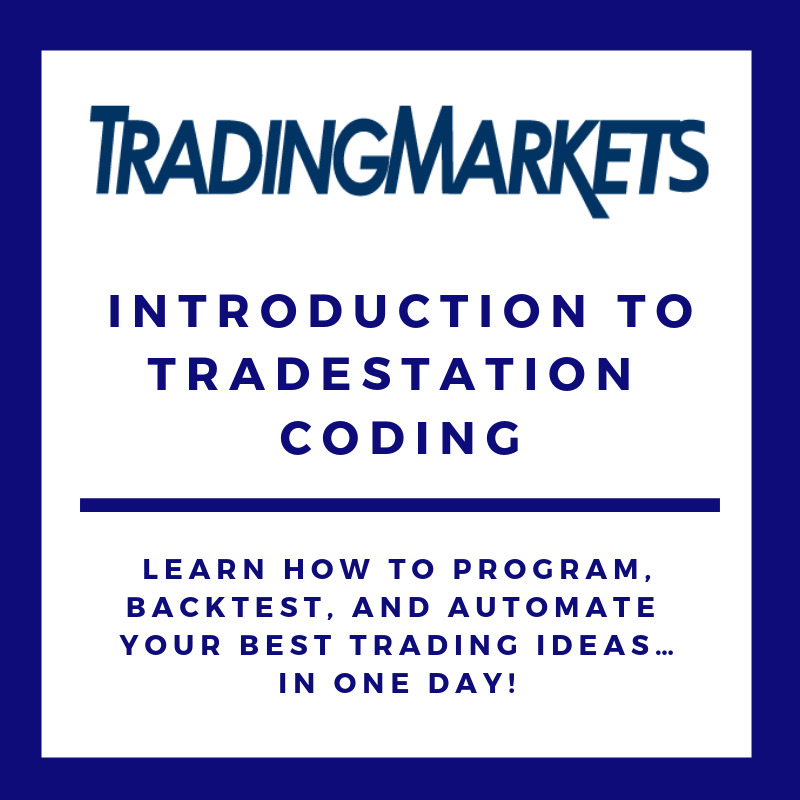 In our first coding session, we will introduce the TradeStation Developer Environment and EasyLanguage, and the tools for creating and running your first Indicator. Fortunately, you need only a limited set of commands to implement a basic indicator or Strategy. TradeStation has an extensive library of built in functions and indicators that allow you to test a wide variety of trading ideas. TradeStation allows you to easily insert built-in indicators like RSI and Moving Averages to your charts. But what if you want to plot a custom indicator like ConnorsRSI? In this coding session, we will discuss the EasyLanguage code that is required to create a custom indicator, and actually write the ConnorsRSI indicator. We will build the "ConnorsRSI Selective Strategy for ETFs and Stocks" and learn how to backtest the strategy. Explaining the mystery of "MaxBarsBack"
RadarScreen is fondly referred to as a "quote screen on steroids" that allows you to monitor up to 1000 symbols. By allowing you to apply custom indicators, RadarScreen alerts you to additional trading opportunities that are available each trading day. You will learn how to use RadarScreen to alert you to entry/exit set-ups and how to monitor existing positions. The TradeStation Scanner gives you the set-ups for the upcoming day. Now you do not need to rely on others for your signals. You will learn how to program your strategies and get the signals for the upcoming trading day. We will learn the basics of how to optimize a strategy. You will learn how to use Auto Execution to actually place trades in the TradeStation simulator(paper trading) and in your real TradeStation account. At the conclusion of this course you will be able to write a simple strategy, backtest it, and automate trading it in the TradeStation simulator. If, after extensive testing in the simulator, you are happy with the strategies performance, you will be able to automate real trading in your TradeStation brokerage account. This includes automating your stocks, ETF, futures, and Forex trading. Throughout this course, you will have the ability to code along with Stuart. Stuart will give the exercise and then you will program the exercise along with him to assure you have mastery of the programming. By the end of this course, you will be in the position to test your strategies, improve upon your strategies, scan for the set-ups for your strategies, and automatically trade those strategies. Learning how to program in TradeStation can save you hundreds of hours and make you a more powerful trader. The cost of “Programming in TradeStation - Learn How to Backtest and How to Automate Your Best Trading Ideas in One Day” is $1000. You will receive a full day of instruction, a copy of one of our Strategy Guidebooks, knowledge on how to backtest your strategies, along with being able to run your scans to get the trades that are signaling. SPECIAL OFFER: If you would like to take both the Beginning and Advanced TradeStation Courses together for a special discounted price of $2,000 (save $500). Click here for more details. Stuart Okorofsky is considered to be one of the foremost authorities in the world in TradeStation Programming. With over 20 years of experience, his clients are in the many hundreds, ranging from individual traders to large hedge fund firms. Mr. Okorofsky graduated from SUNY Buffalo in 1974 with a Degree in Computer Science. After graduation he worked for McDonnell Douglas as a programmer. In the early 1990s, he began trading Futures and shortly thereafter began programming in TradeStation. Mr. Okorofsky then began programming trading systems in TradeStation for other traders and has continued to work with and teach traders over the last 20 years. He has also worked with a number of high profile trading strategy experts including Tom DeMark, Walter Bressert, and Dave Aronson. Tradestation is a registered trademark of TradeStation Group, Inc. This course is not sponsored, affiliated, or endorsed by TradeStation Group, Inc.